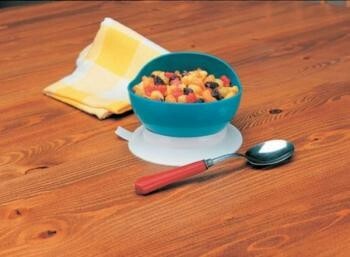 The curved rim guides food onto the spoon whilst the slip-resistant base helps keep the bowl firmly in place. Suction Scooper Bowl... This 110mm (41/2") dish has a suction base attached. The curved rim guides food onto the spoon whilst the slip-resistant base helps keep the bowl firmly in place. Once the suction ring has been removed, the bowl is dishwasher safe. Colours may vary.